We all know that meetings are expensive. Time is precious, and having many people in a room is quite costly by any measurement. The cost of an interrupted workflow is even worse, especially for a small business! You might be especially productive early in the morning, from the moment you start working. I might require an hour or so of build-up time before I'm ready to get cranking. But when a meeting starts, our preferences and differences are cast aside. Meetings strip us of the core tenet of the creative process: autonomy. We can't rid the world of meetings. After all, the benefits of meeting does sometime outweigh the costs. But we can meet more wisely. Here are a few tips I observed in productive teams. 1. Beware of "Posting Meetings"
If you leave a meeting without action steps, then question the value of the meeting (especially if it is recurring). A meeting to “share updates” should actually be a voice-mail or an e-mail. Gathering people for no other reason than "it’s Monday!" makes little-to-no sense, especially when trying to filter through the bloated post-weekend inbox. Automatic meetings end up becoming “posting” meetings. At the end of every meeting, go around and review the action steps each person has captured. The exercise takes less than 30 seconds per person, and it almost always reveals a few action steps that were missed. The exercise also breeds a sense of accountability. If you state YOUR action steps in front of YOUR colleagues, then YOU are likely to follow through. One best practice I observed in the field was “standing meetings” — meetings in which people gather and remain standing. The tendency to sit back and reiterate points — commentate rather than content-make — dwindles as people get weak in the knees. Standing meetings become more actionable. Courtney Holt, the former head of Digital Media at MTV and now the Head of MySpace Music, insists on the value of standing meetings in his team, "I try to make every meeting — especially those that are called last minute — a standing meeting...ideally each meeting finishes as quickly as it can." Most impromptu meetings that are called to quickly catch up on a project or discuss a problem can happen in 10 minutes or less. Behance's Chief of Operations, Brittany Ancell, suggests starting every meeting with a simple question, "Why are we here, and what are we supposed to accomplish?" 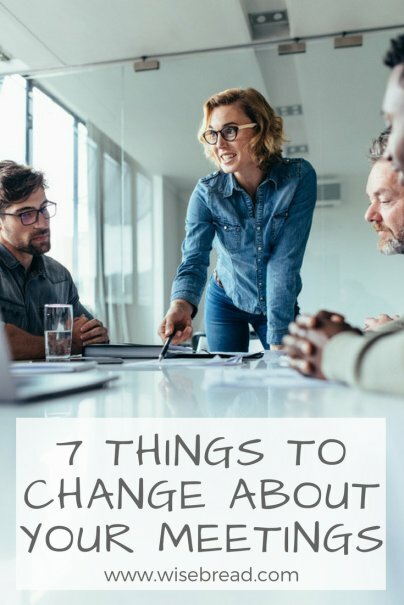 As she explains, "Laying out the objective and setting the meeting’s tone is one of the leader’s key responsibilities." 6. Bring Back Transit Time! Building in 10-15 minutes of travel time between meetings can significantly reduce stress. In an article for Harvard Business Review, entrepreneur and business writing teacher David Silverman makes the point that, in grade school, when the bell would ring, we knew we had 15 minutes to get to the next class. "Why is it?" he asks "that when we graduate, they take away our bells, replace them with an irritating "doink" sound signaling "5 minutes until your next meeting" and assume we can now teleport to the location of same? What could cause such madness? In two words: Microsoft Outlook." It seems that the default principles of corporate scheduling have stripped us of the precious transit time that keeps peace of mind between meetings. To bring it back, Silverman suggests that, when scheduling an hour-long meeting, put it in the calendar for 50-minutes. LifeHacker reported a retrospective study from the online meeting scheduling service "When is Good" where, after reviewing over 100,000 responses to 34,000 events on their platform, they realized that Tuesday at 3pm was the most "available" spot for a meeting. Such a finding suggests that there may be certain times (and days) during the week that, despite varied workflows, work best for your team. Hey, it's not scientific, but it's worth keeping in mind! Admired leaders recognize the need to measure the value of meetings. Among the most productive leaders and teams I observed throughout the research for my new book, I found that the vast majority of teams shared a healthy hesitation to call meetings. Consider the above tips as ammunition against wasting precious resources in your small business. 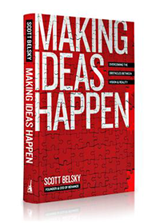 This guest post is by Scott Belsky, Founder of Behance and author of MAKING IDEAS HAPPEN, a new book that chronicles the methods of exceptionally productive people and teams. Standing meetings are great. You immediately feel more energized and action oriented. I highly recommend them. I just finished building a treadmill desk. I love it! When I have more time I'll do a quick post on it. Great ideas! Ideas I want to promote as I meet with others. An additional option as I think this through is, consider how to implement with those who are not so mobile/use wheelchair/other assists. Prob huddling meetings make sense as long as not around a huge meeting table with comfy chairs that may communicate the group is settled in for the "duration". Reactions/responses? Good tips. We really try to avoid any version of status meetings. As you've said, there are a lot better tools available that take less time from everyone. Haven't tried the standing meetings yet, but I have been tempted. One thing we do is limit meetings to tue and thur afternoon. Serves as a meeting throttle and it has worked well. Scott is the Founder of Behance and author of Making Ideas Happen.